The paper considers steric level fluctuations in the northern Atlantic Ocean. 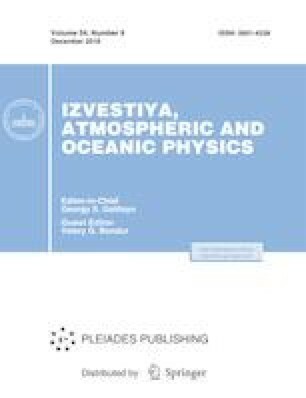 We use a method that combines AVISO altimetry and GRACE gravity measurements to evaluate steric level fluctuations and obtain estimates of steric variations in the Labrador and Irminger seas for 2003–2015. The range of steric fluctuations in the Labrador Sea is from –11 to 10 cm, and in the Irminger Sea is from –11 to 12 cm. We estimate trends of steric fluctuations, which indicate a significant increase in the steric component of variability in the level of the North Atlantic. We propose a method for determining regions of deep convection in the Labrador and Irminger seas based on the minimum values of the steric level anomalies (the seasonal component has been excluded) from combined satellite measurement data. Possible spots of deep convection are determined in the Labrador and Irminger seas and shown on steric level fluctuation maps for different years. We demonstrate that deep convection was not manifested in the Labrador Sea in 2006, and there was a general weakening in deep convection processes in the North Atlantic after 2008. The study was financed by the Russian Science Foundation, grant no. 17-17-01151.